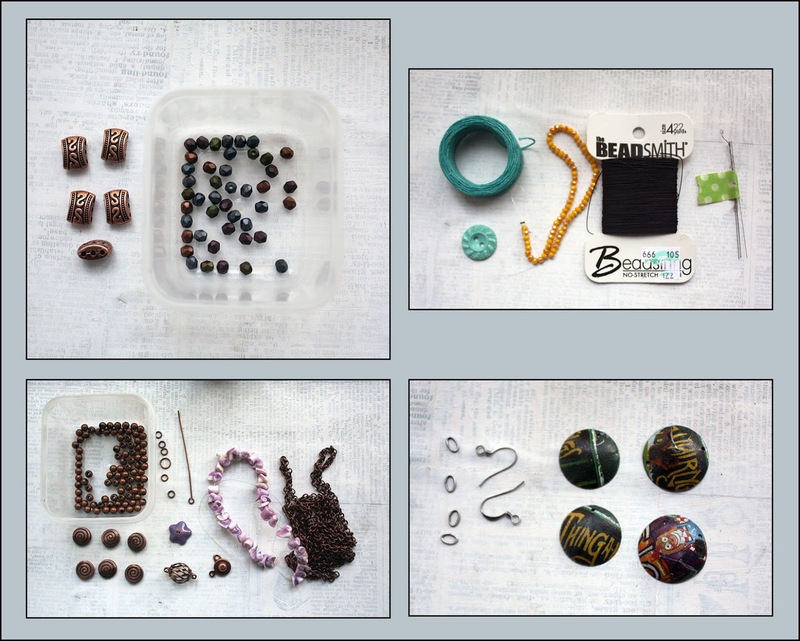 Between the Bead Peeps Swap-N-Hop and some of the other challenge reveals I've worked on, you might think I've been too busy to restock my bead box. But, that's not the case. In fact, I restocked it at the beginning of March. However, I have been too busy to mention it and ALMOST too busy to work on the projects in there. 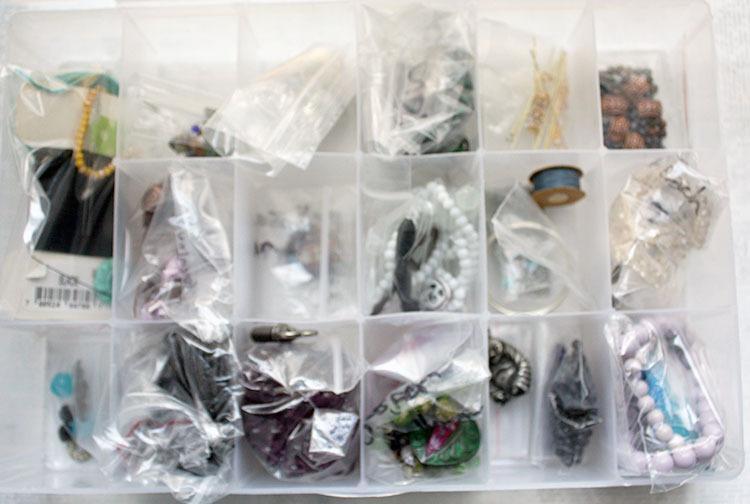 If you're not familiar with my bead box, it's just a basic divided craft organizer. Into each compartment, I put the components for a design. And, when I need I project to work on, it's there for me. I first stocked it back in October with a reveal in December. Then, I restocked the box in January, revealing the designs in March. Here's how I stocked it this time around. I know, I know. It's hard to make anything out of that photo. Well, I had to put everything in baggies as I had trouble (in the other two boxes) with the smaller beads escaping into other compartments and confusing me. So, the baggies give the photo a blurry, mysterious feel. Sorry! Finding inspiration to stock this bead box was difficult. I just wasn't feeling it. Then, the perfect challenge and solution presented itself! I used the March Bead Challenge from Fusion Beads to fill each compartment to kinda-sorta match up with the first 17 days. Here's a better look. 1: Make an easy pair of earrings - I pulled an altered Vintaj blank and corresponding beads together. 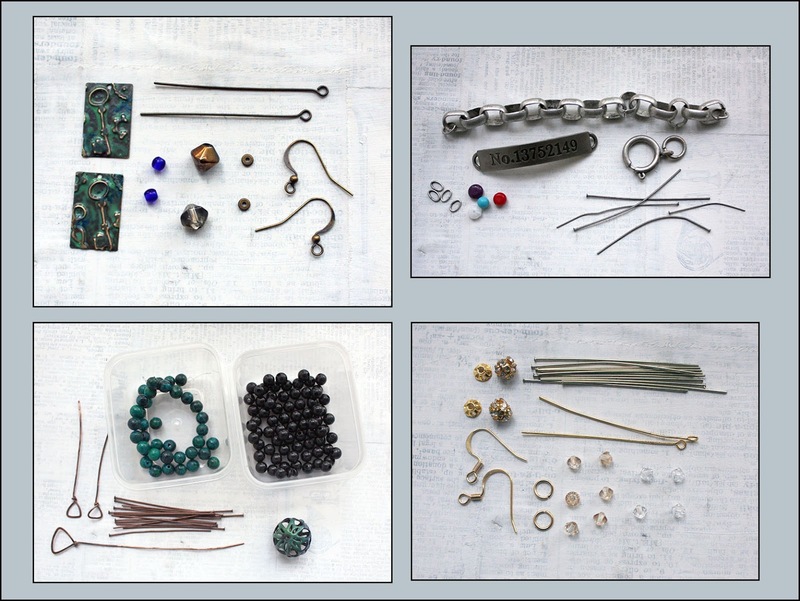 2: Create a piece with chain as the main element - A large, chunky chain in my stash caught my attention. Its antiqued silver tone compelled me to pick a matching bar from Tim Holtz that I bent into a bracelet shape. As well, I grabbed several beads that just happened to be already sitting on my desk. 3: Design a set of jewelry - I quickly decided on a necklace and earring set and created a few components with antiqued copper wire. I selected an enameled filigree bead as the focal then chose matching stone beads along with black ones for the rest of the design. 4: String something with bicone crystals - Here's where things started to get tricky for me. I just happen to have a few bicone crystals in my stash. But, not near enough to "string" something. So I improvised and selected a few along with other materials to make earrings. 5: Bead something with two-hole SuperDuo beads - Again, tricky! I think SuperDuo beads are something you use in seed beading and not something I own. So, I improvised and decided to make something using two-hole beads. But...I couldn't find any of those in my stash. I did locate a few three-holed copper beads, but I'll be treating them like two-hole beads for the sake of the challenge. I also went with some multi-colored glass beads that match the copper nicely. 6: Whip up a wrapped cord bracelet - I've never made a wrapped cord bracelet but found the instructions on the Fusion Beads site easily enough. I selected bright yellow Chinese crystals (from ZnetShows.com), turquoise waxed linen cord, black beading thread, and a turquoise button. It'll be fun to learn a new technique. 7: Create something unique using flat spiral stitch - What? Haha. I think that's another seed-beading technique. Instead, I zeroed in on the word spiral and grabbed more of the spiral copper beads that I used in one of my Swap-N-Hop pieces. I also selected the violet shell beads from my partner because they're little spirals too. 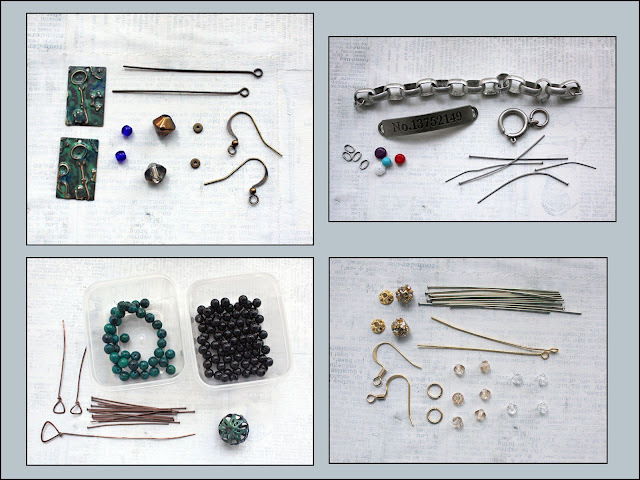 In addition, I picked out 4mm copper beads, an enameled bead cap, a copper connector bead, findings, and loads of copper chain. 8: Fix or finish a project - This was easy enough, I have tons of unfinished projects sitting around. I grabbed the one closest at hand: tin waiting to become earrings. 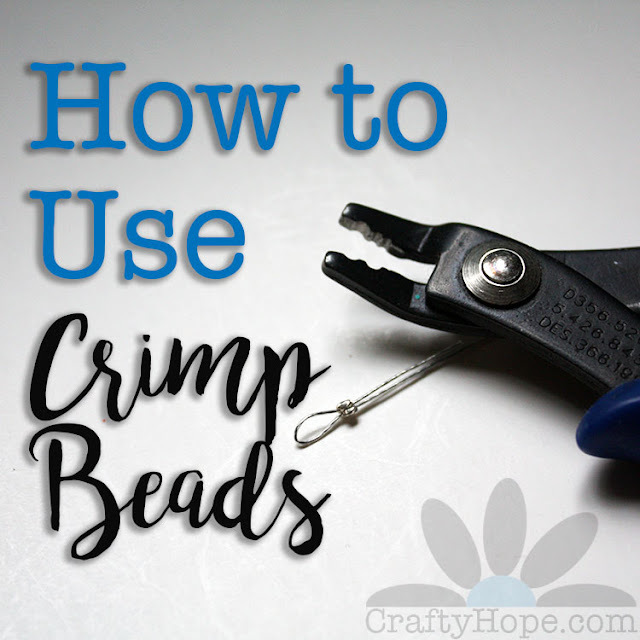 9: Gather your best beading buddies and have a bead night - Since that's not completely feasible for me, I decided instead to think more in terms of online friends and participate in Sarajo's Honey Do List Challenge. I have to admit that I skipped ahead in my bead box to make sure I got this one done for the reveal. I chose a rusty key, scrapbook label, matte black and clear glass beads, and white glass beads. 10: Learn a new beading stitch - I only have a vague idea for this one, but it'll be something new for me. There are large silver-tone hoops, beading thread, and labradorite-colored seed beads. 11: Feature charms - This wasn't too hard. 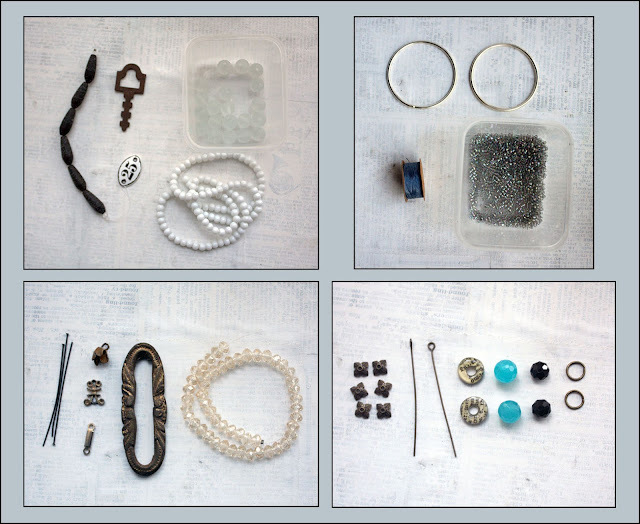 I selected a few charms from one of my drawers, chose a large hoop, and picked out beads. Next is just to make it! 12: Design jewelry that features your favorite color of Swarovski - I simply went with my favorite color. It's that blue in the picture - though the color isn't coming through as true. I also picked out bead caps, text washers, black crystals, and findings. 13: Construct jewelry with gemstones - I selected small labradorite beads for the gemstone portion of this challenge and decided that I would try another of the wrapped cord bracelets. As such, I opted for black cord and a clear button (I'll use the thread from Day 10). 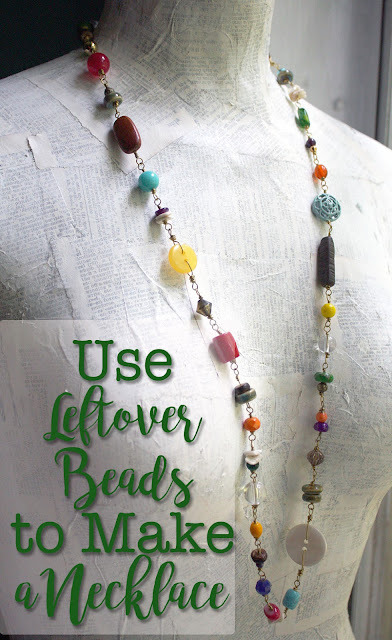 14: Create a long necklace, at least 24 inches - This isn't new to me at all. I love a nice, long necklace. I picked a small key and a bunch of purple glass beads. 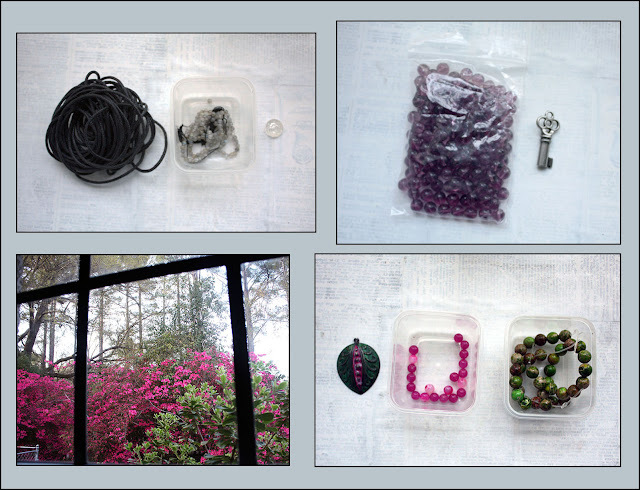 15: Work up jewelry inspired by nature - For this, I looked out my window at the azaleas in full bloom (bottom left) and decided to use that color palette. First, I colored a Vintaj blank with Patinas then picked out fuschia (dyed white jade) and green (jasper) beads to match. 16: Make a handmade gift for a friend or family member - Just days before deciding on this challenge, my niece handed me the Buddha charm and asked me to make something for her. Since she's in high school, I was reminded of the short, almost choker, necklaces with a simple charm that I wore when I was her age. So, I selected a few black beads with some cobalt ones to create a similar style necklace for her. 17: Make a project using one of our seed bead palettes - Searching through Fusion Beads' palettes, there were quite a few that caught my attention. However, the Hyacinth one was my favorite. While my selections aren't the same, they were definitely inspired by the palette. I picked out a Gaea pendant with a beautiful violet and blue glaze on it, pale violet beads, and bright aqua beads. I have to admit that I've been quite distracted with tin over the last month and haven't made it very far into the bead box, but that's kinda what it's there for - to have a project ready to be made when I'm not feeling inspired. As long as I'm inspired, it's not a problem. And, with the Fusion Beads challenge list, I still have almost half a month of inspiring prompts to restock the box when I'm done! Where have you turned for project inspiration lately? Usually I can zero in on a set of your beads that I like to follow to see the end result, but each set has its intrigue and beauty, so I can't wait to see them ALL! The shape of that key in #9 is FANTASTIC!!! I love your method of grouping projects together. I have a muffin tin for earrings. I use plastic bags for bracelets and necklaces. I find that it cuts down on my dragging through my beads over and over and I end up with less of a mess to clean up.